It’s no secret that Flywheel has grown quite a bit since our humble beginnings as a three-man operation back in 2012. (In fact, we were in the top 500 of fastest-growing companies in 2018!) 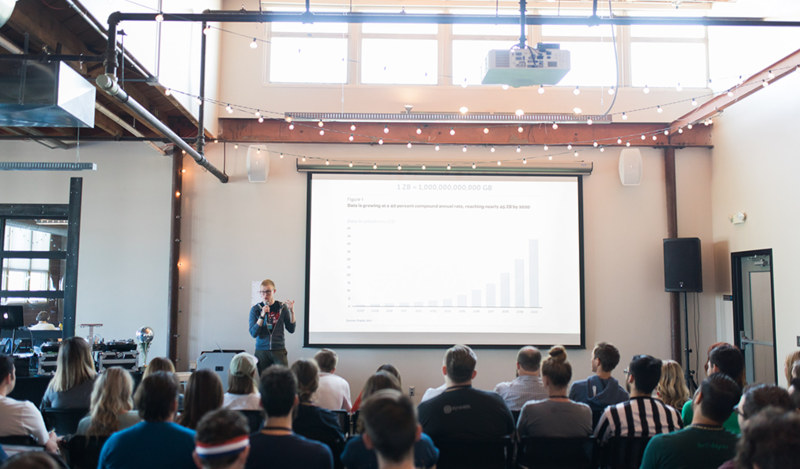 So, how do we ensure that Flywheel continues to have the fun-loving, hardworking, dog-obsessed startup energy we started with, even as we scale the company for more than 200 people and beyond? Well, the most important thing that has kept us grounded as we’ve grown are our core company values. These values are instilled into each and every Flywheeler, whether they’ve been here for five years or five days. They connect our teams across the company, and unite Flywheelers around the world! They remind us what’s important at the end of each day, and they keep us motivated to do our best work. And…our values are no secret! Here are the seven core values that make the whimsical world of Flywheel go ‘round. We care about our customers, and our customers’ customers. We work tirelessly to bring them the answers they’re looking for, even if that means staying half past 5 on a Friday. We’re also excellent to our fellow coworkers, which means helping clean up after lunch or restocking the La Croix when the fridge is getting low! Treating others as we would want to be treated is a company standard. We enjoy helping one another and are empathetic to what other people need. Flywheelers cheering on Lauren, one of our amazing recruiters, in a company-wide Rock, Paper, Scissors tournament. Our environment may be super fun and ridiculously relaxed at times, but in everything we do, we’re striving to challenge the status quo. Whether that means our product team building a brand new Cloud Platform from scratch or our marketing team finishing an advertising campaign on Friday and announcing a sweet new product feature on Monday, we’re constantly pushing ourselves to be better. We do difficult things. We embrace growth. We are also just literally hungry. Chefs, foodies, bakers, and competitive food eaters can all be found here at Flywheel! 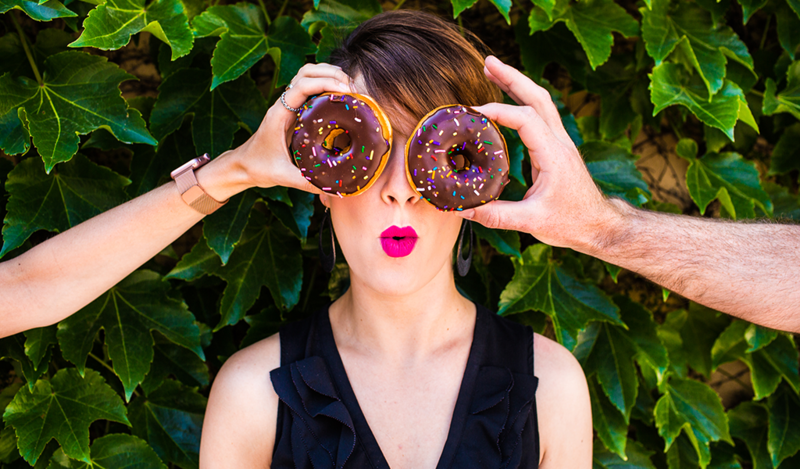 Kaitlynn, a remote Customer Experience team member, celebrating national donut day (with a little help from her friends). Trust us, we know we’re not perfect. But, we’re constantly striving to improve our company, our products, and ourselves. We embrace failure, encourage experimentation, and trust that everyone here is here for a reason. We know “failing up” can be such a cliché, but we’ve learned a lot from the things we didn’t quite get right the first time, and we’re totally okay with that. A group of Flywheelers celebrating after we revamped our Customer Experience team! Our mission statement of “we help creatives do their best work” isn’t just something we paste into our Insta bio and call it a day, it’s something we fully embody. Because of the way our products are designed, our customers can skip the stress and get straight to creating beautiful websites. Our own brand is also built on intentional, thought-out design. Whether it’s the way we answer the phone to the swag we send to our awesome clients, design is the foundation of everything we do. 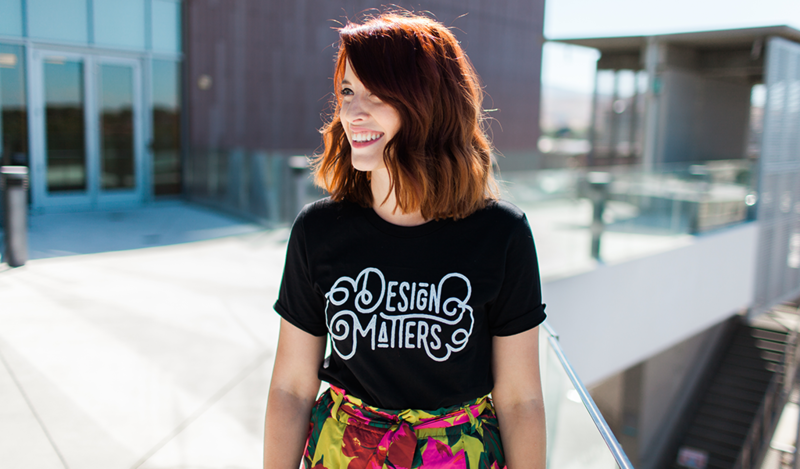 Jamie, our Head of Marketing, wearing the “Design Matters” mantra, quite literally, on her sleeve. PS, want to win this shirt?! We don’t need to go into too much detail here. 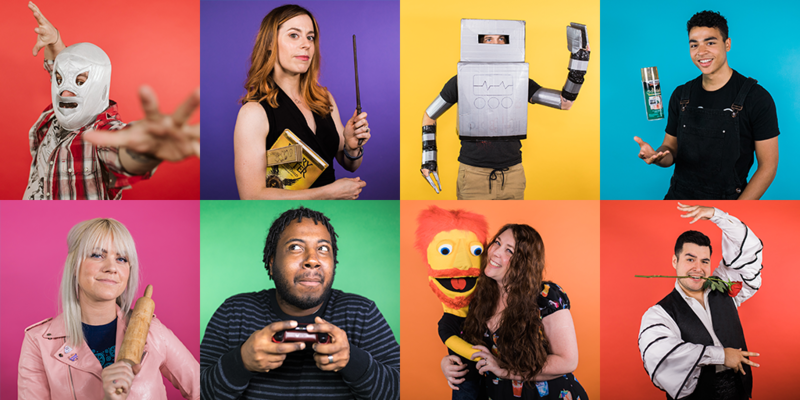 Flywheel is full of passionate creatives (and full of nerds)! We have musicians, crystal collectors, calligraphers, comic book readers, theatre directors, fitness enthusiasts, fashion designers, gamers, and so so so much more! We embrace our team members, no matter who they are! We weren’t kidding about embracing weirdness! We are productive community members. 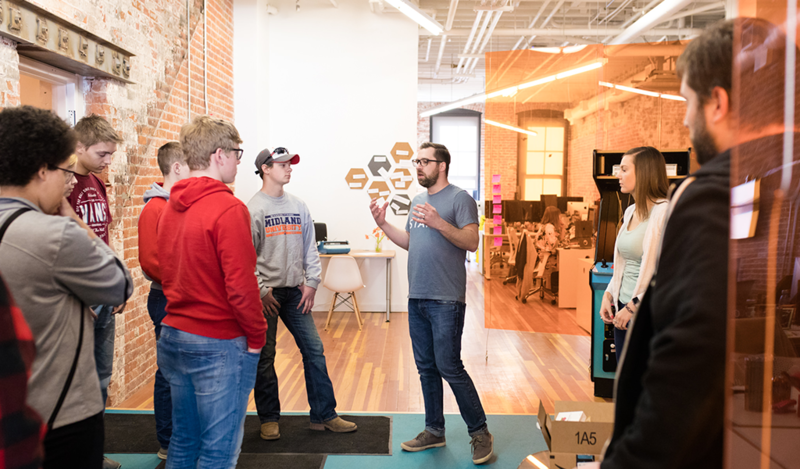 Tommy and Keegan, two members of our product team, chatting with future WordPress enthusiasts at our office; they spent the day learning about Agile methodology. 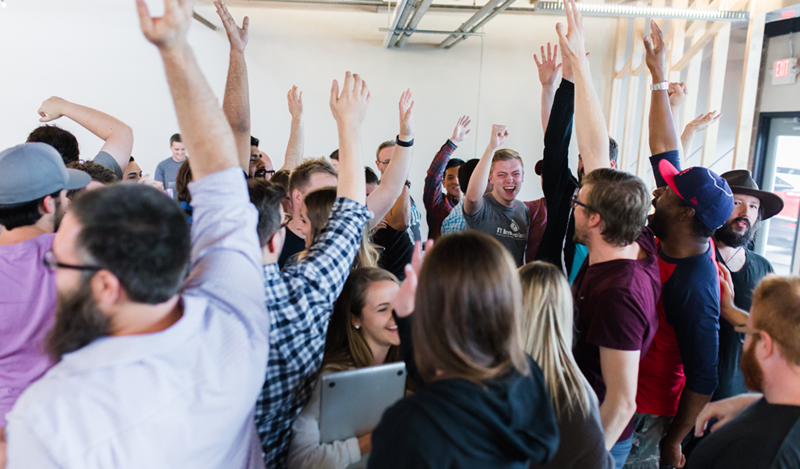 Flywheel is lucky to be a part of so many communities: WordPress, Silicon Prairie, the design community, and our local Omaha community (just to name a few)! We fly to places like Serbia and Australia so we can engage with Flywheel and Local users around the world. We invite future WordPress developers to our space and teach them a thing or two. We host donation parties (with ridiculously cute animals) and give back to the communities that make us proud to be from Omaha. We strive to positively impact each and every community we belong to. We are data-informed, not data-driven. We love design, but we realize that data must inform any decision that will impact Flywheel in a big way. We measure relentlessly, but, we don’t listen to data so much that we ignore our experience or forget to think outside of the box. Flywheel strikes a delicate balance between design-focused and data-driven, and we’re able to do this thanks to our stellar data team! Matt, our data scientist, teaching the company how we all can use data in each of our roles at Flywheel. So there you have it! The seven core values that help Flywheelers do their best work. 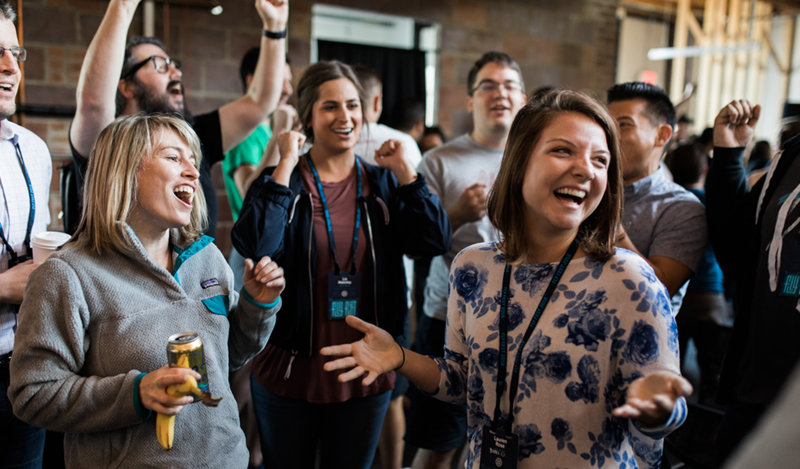 These values, combined with the guidance of our leadership team and the tenacity that drives each of our team members, allow Flywheel to grow and scale at ease. We love being inspired by our values on a daily basis, so naturally we created a desktop background with our signature “Design Matters” design! If good design is something you care deeply about, too, feel free to download it for your own dose of daily inspiration!